> post, in the form of a question. > Egypt, or it's mythology, in Israel? The princes are prostrate, saying, "Peace!" Elephantine papyri, 5th Century BC. They are a collection of ancient Jewish manuscripts dating from the 5th century BCE. They come from a Jewish community at Elephantine, then called Yeb, the island in the Nile at the border of Nubia, which was probably founded as a military installation in about 650 BCE during Manasseh's reign to assist Pharaoh Psammetichus I in his Nubian campaign. The dry soil of Upper Egypt preserved documents from the Egyptian border fortresses of Elephantine and Syene (Aswan). Hundreds of these Elephantine papyri, written in hieratic and Demotic Egyptian, Aramaic, Greek, Latin and Coptic, span a period of 1000 years. Legal documents and a cache of letters survived, turned up on the local 'gray market' of antiquities starting in the late 19th century, and were scattered into several Western collections. Though some fragments on papyrus are much older, the largest number of papyri are written in Aramaic, the lingua franca of the Persian Empire, and document the Jewish community among soldiers stationed at Elephantine under Persian rule, 495–399 BCE. The Elephantine documents include letters and legal contracts from family and other archives: divorce documents, the manumission of slaves, and other business, and are a valuable source of knowledge about law, society, religion, language and onomastics, the sometimes surprisingly revealing study of names. The 'Passover letter' of 419 BCE (discovered in 1907), which gives detailed instructions for properly keeping the passover is in the Egyptian Museum of Berlin. This post is regarding Egyptian/Canaanite interaction in the MK: HERE. In the 13th Dynasty of Egypt, Canaan invaded the Nile Delta and formed their own kingdom there. 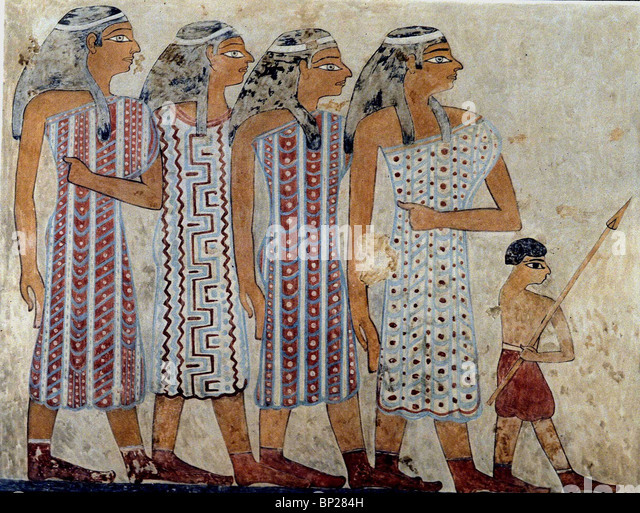 The Shasu were a group of Levantine nomads which Egyptian texts dating to the 18th/19th Dynasties c. 1300BC make reference to including what most scholars agree to be the name of Yahweh translating to “the land of the Shasu of Yahweh." The cult of Yahweh probably did not start taking shape until around the 14th century BC though it would not be until sometime after the 1st millennium that He gained a status of a nationalistic god when the states of Israel and Judah were formed, but regardless, one of many nationalistic gods of the region of which Yahweh was a conglomeration. The short of it is that Egypt and the Levant have had an intimate relationship going back well before the Dynastic period that continued in one form or another throughout the Dynastic Period. Regardless, if one is looking for some kind of Biblical mythology influence on Egyptian culture it does not exist, nor did Yahweh prior to his invention sometime in the late second millennium. Edited 1 time(s). Last edit at 21-Nov-17 05:07 by Thanos5150.